We just released a new patch for Heroes of the Storm, which brings a new Hero, User Interface improvements, and many balance changes to the game. Check out today’s patch notes below! All players will have access to an extended free-to-play Hero roster in Training and Single Player Versus AI games, which contains the first 30 Heroes to enter the Nexus. This extended free-to-play Hero roster in Training and Single Player Versus AI games will last until the week of August 23. Playing as Auto-Select in Quick Match will now award 100% bonus XP when the matchmaking system detects lengthy queue times for one or more Heroes. A new icon will display over the Auto-Select portrait during Hero Select when bonus XP is available. New portrait rewards have been added! Terran Front-Line Portrait – Awarded for reaching level 10 with Nova, Lt. Morales, and Sgt. Hammer. Legacy of the Void Portrait – Awarded for owning a copy of StarCraft II: Legacy of the Void. Gul’dan, Darkness Incarnate, has been added to Heroes of the Storm and is now available for play! Read on for a brief overview of his Abilities. Gul’dan does not regenerate Mana. Activate to sacrifice a portion of your Health, restoring 25% of your maximum Mana. Release a wave of flame that damages each enemy it passes through. Drain the life from an enemy over 3 seconds, dealing damage to the target and healing Gul’dan each second while channeling. Call forth three bursts of shadow energy in a line, which deal damage to each enemy they strike over 6 seconds. Stacks up to 3 times. After a short delay, deal damage and Fear all enemy Heroes in the area for 2 seconds. Summon a rain of meteors in a large area for 7 seconds. Each meteor deals a damage in a small area. Various performance improvements have been made which should positively affect overall framerates. This should help to reduce memory usage, increase performance while the game is not the primary focus window, and allows for further optimization improvements in the future. Various environmental objects have been optimized to use less processor time. These changes will benefit processor constrained systems. Fixed an issue in which environmental sounds could be over-created, causing drops in processor performance. A new performance icon (pictured below) has been added that will display in the upper-left corner of the screen when Heroes of the Storm detects that the computer’s processor is not performing optimally. Visual effects for Movement Speed buffs have received additional polish, and will better indicate whether a Movement Speed buff is greater or less than 25%. Visual effects for Movement Speed Slows have received additional polish, and will better indicate whether a Slow is greater or less than 40%. Murky has received a delicious new Hearthstone (B) animation! New button art has been added for the Bribe Talent. Many Basic Attacks and skillshot Abilities will now display impact effects on Shields when striking Shielded targets. The indicator that displays at Falstad’s landing location while using Flight has received additional visual polish. Balespider Gul’dan Bundle – Available until July 26, 2016. Leading Ladies Bundle – Available until August 2, 2016. Ultimate Leading Ladies Bundle – Available until August 2, 2016. 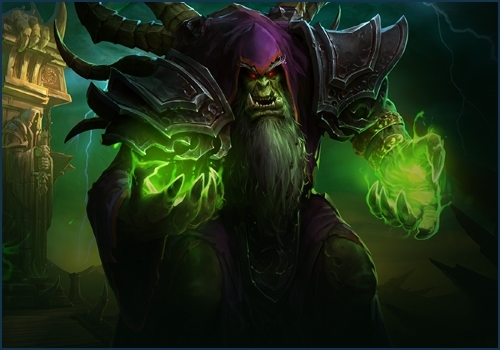 Gul’dan has been added to the in-game Shop. 2016 Summer Champion’s Nexagon – Available until a new champion is crowned during the 2016 Fall Championship. Kael’thas’ prices have been reduced to $8.49 USD and 7,000 Gold. A Breaking News icon has been added to the top navigation bar in the game menus, and will activate whenever important announcements about Heroes of the Storm are posted, including details about scheduled maintenance, game updates, and more. Hover the cursor over the Breaking News icon to display details about these announcements. A notification will also be displayed on the Home Screen whenever a Breaking News post is active. Left-clicks can now be issued through all in-game UI elements while the cursor is in targeting mode. Healing Wells will now display on the minimap in the form of plus “+” icons, until they are destroyed. Gameplay tips will now display on loading screens when entering a match. Rejoin is now optional for Training, Single Player Versus AI, and Custom Games. Simply hit the “Nope!” button when prompted to Rejoin. Thai language chat messages received from other players will now display appropriately in Heroes of the Storm. Elite A.I. players will now attempt to seek out and take down lone enemy Heroes who venture too far from safety. ?If a Mercenary Camp is completely captured using Bribe, the camp respawns 50% faster. Reduced cooldown from 40 to 30 seconds. Developer Comments: Please see the developer comment at the top of the Heroes section. Developer Comments: A lot of these changes are designed to further emphasize what we see as Jaina’s unique role: battlefield control. We want to play up her ability to deny areas of the battlefield with Blizzard, and really punish enemies who get stuck inside it. The biggest change in that regard is that she now spawns 3 waves of Blizzard baseline. To go along with these core kit changes, we’ve also changed or moved around a few of her Talents. One of the biggest changes was Snowstorm, which increased the radius of Blizzard, as we found that it lowered the difficulty of landing consecutive Blizzard waves on enemies too much for a Talent in such an early tier. Improvements have been made to the clickable area within Medivh's Portals, which should result in fewer misclicks when attempting to enter them. Each of The Lost Vikings will now display individual messages in chat when using Hearthstone. Developer Comments: Insight was seeing very little play, mainly because it wasn’t distinct enough. In order to both buff it and make it different, we’re making it a Quest Talent/Trait. We felt the cooldown reduction fits well with the increased Mana, as Insight is about using all your Abilities (both offensive and defensive) more frequently. Cooldown reduction when using Holy Light against enemies increased from 4 to 6 seconds. After casting Holy Light, all Basic Attacks for 5 seconds will Heal Uther and all nearby allies for 20% of the amount Healed by Holy Light. Each Hero that Holy Radiance passes through increases the Healing and damage of your next Holy Radiance by 8%, up to a maximum increase of 80%. Developer Comments: The famous “Piano Uther” build (Uther with all Activated talents) has dominated his talent choices for a long time. While we understand that many players love this kind of a Support, we also want to give him more viable options for people who don’t like so many activated abilities. We didn’t touch the old build, but we have given him more options to choose from on various talent tiers. Developer Comments: It took a lot of pressure to get the balance team to make some adjustments to Dehaka. With absolutely no changes since launch, we finally have a few tweaks to help bring up some struggling talents. Base Heal effect increased from 1.5% to 2% maximum Health per second. Critical Health effect increased from 3% to 4% maximum Health per second. No longer grants Unstoppable while leaping. Now grants Muradin Resistant (25% reduced damage taken) for 2 seconds. Mana cost reduced from 70 to 55. Developer Comments: The Dwarf Toss changes are very likely going to spur a lot of conversation, Uther knows it did in our bullpen! The logic behind this change is as follows – We want to buff Muradin for all ranges of play EXCEPT our pro-scene. Of course this is where the Unstoppable leap is abused the most, and even though there is some great skill-cap behind knowing when and how to use it, it gives him an incredible amount of power and definitely hurts the pick-rates of our other Warriors. By replacing this with a 2 second Resistant buff, it should help the vast majority of players feel more tanky when they use Dwarf Toss, which has always been the intention. Developer Comments: We decided to do a quick clean-up for Stitches. This consisted of getting rid of the lingering gas-cloud which hurt our visual playfield more than the enemy team. Oh, and we made Helping Hand baseline; nothing to see here, move along. Increased Movement Speed bonus from 25% to 30%. Developer Comments: Tyrael’s Talents have been stagnant for some time, and we saw an opportunity to spruce them up. We’ve added some power to his lesser-used Talents, and given him some new ways to bring more utility to his team. While we understand that many players will miss Angelic Momentum, we felt that it was best to remove it from Tyrael in order to have more design space to add other Talents that manipulate the cooldowns and durations of his abilities. Artanis: Purifier Artanis’ blades have been slightly scaled down to better fit within his armor. Cho’gall: Fixed an issue causing the Corruptor Cho’gall skin and variations to appear at a lower resolution than intended while using High graphic settings. Chromie: Cancelling Chromie’s dance animation and then restarting it will no longer cause one of her clones to dissipate too early. Rexxar: Will now animate properly while riding Mounts that hover. Tomb of the Spider Queen: The Top-lane Keep on the left side of the Battleground can no longer attack enemies who are standing next to the Gate. Tomb of the Spider Queen: The number of Spider Gems held by each team will now always display, even if zero Gems are currently being carried. Try Mode: The Mana bonus applied by Arthas’ Eternal Hunger Talent will no longer persist after clicking Reset Talents. Try Mode: The effects of Li’Ming’s Aether Walker Talent will now be properly reset after clicking Reset Talents. Try Mode: Brightwing’s Phase Shift cooldown is now properly reset after clicking Toggle Cooldowns. Anub'arak: Bed of Barbs will now properly apply damage over time effects to enemy Immortals on Battlefield of Eternity. Cho’gall: Runic Blast’s traveling and end-point area of effect indicators will now display appropriately for Gall, and will no longer display for Cho. Dehaka: Drag will now properly interrupt Tychus if he is struck while attempting to cast Grenade. Jaina: Casting Blizzard while hidden within a Shrub will no longer prevent players who are outside that shrub from seeing its visual effects. Kael’thas: Fixed an issue which prevented Phoenix from being self-cast using ALT + R.
Kael’thas: AI Kael'thas will now properly receive a reduced cooldown timer after cancelling Pyroblast. Kharazim: Fixed a rare issue in which movement commands could persist after casting Radiant Dash. Lunara: Leaping Strike can now properly damage enemy Structures after learning the Boundless Stride Talent. Lunara: Landing against the terrain after casting Leaping Strike will no longer occasionally cause Lunara to run back to her original location. Lunara: Forts and Keeps will now properly fire on a Wisp that it is just inside attack range. Medivh: Fixed an issue which caused allies to see Portal’s range indicator after learning the Portal Mastery Talent. Stitches: Hook will now properly pull its target over unpathable areas of terrain, even if the enemy it strikes had been launched by another Ability. Tracer: Fixed an issue that could cause Pulse Bomb to launch in an unintended direction when casting Blink while Pulse Bomb is firing. Tracer: The Reload bar will now be properly displayed during Recall after learning the Locked and Loaded Talent. Tracer: Will no longer continually face her Basic Attack target while Polymorphed. Tracer: The Composition B Talent can no longer be triggered by sticking non-Heroic targets. Tracer: The “Lock On” icon next to Tracer’s status bar will now appear to the left of icons for Battleground Mechanics that can be held, such as Spider Gems and Doubloons. Tychus: After learning the Sizzlin’ Attacks Talent, Basic Attacks will now properly deal 3% of the target’s maximum Health as damage while Minigun is active. Tyrael: Casting Judgement on an enemy just as the target is killed will no longer teleport Tyrael to the enemy safe zone. Tyrael: The duration bar for El’Druin’s Might can no longer display during Archangel’s Wrath. Uther: Can no longer use Healing Wells while in Eternal Devotion form. Fixed an issue which prevented Heroes from playing their “Pissed” voiceover lines after being repeatedly clicked. Anub’arak: Voiceover will now play properly while idling on Anub’arak’s Hero page in the Shop. Azmodan/Kharazim: Fixed an issue that prevented Azmodan and Kharazim from playing certain voiceover lines after killing an enemy Hero. Gazlowe: The music associated with Big Top Gazlowe’s dance animation will play appropriately while in Robo-Goblin form. Tracer: The Blink recharge sound effect will now only play for the Tracer player. Selecting unowned Heroes, Skins, or Mounts during Hero Select will no longer disable the ready button for other players in the party, nor remove those players from the queue. Rebinding a Hotkey to the Left Mouse Button will no longer cause a Primary Hotkey Unbound message to display. The time displayed by the clock on the Home Screen will now properly match the operating system’s clock when using the RTZ 4 timezone.